Sorry about the lack of information as of late, but busy doesn’t even begin to describe my work for the past few months…what with the exciting new project coming along (hint: yes, we’ve heard your requests! ), and at the same time implementing some of our most crazy ideas for the new gardens in Eden Encore. Eden Encore will be coming out very soon in April. Get ready for zero gravity, mirror worlds, all new music from Baiyon, and we’ve added something extra special at the end which is a Big Secret(tm) and is a present to all the fans. On top of all this, we’re flying along with the next new PixelJunk title (we’re calling it #4 for now) and even experimenting with future PixelJunk ideas too. But things just keep getting more exciting because PixelJunk Eden has been nominated in not just one, but three (!!!) categories at the upcoming Independent Game Festival‘s award show in San Francisco, CA. We are also nominated for the GDC Choice awards too, which are held during the same week. So GDC is going to be pretty crazy and even busier than normal, and I am looking forward to it a lot! Oh, and before I forget, on Friday, March 27 at GDC, Baiyon will be doing a talk about Eden and the use of CMYK in his graphic design work. I’ll be there in the audience listening in of course, so if you’re attending GDC, be sure to come check out this talk. Anyway, back to work. I’ll pop back soon to detail more specifics about Eden Encore, so watch this space! No new infos?! loll cant wait to hear more about your next game, any hint or something lol? Nice to see you back on the Blog Dylan..now get back to work! Looking forward to hearing more. I DONT CARE ABOUT THAT EDEN THING, TELL ME MORE ABOUT MONSTERS!!!!!!!!!!!!!!!!!!!!!!!!!!!!!!!!!!!!!!!!!!!!!!!!!!!!! Cool man. I got to say, PJ Eden is just an awesome platform and i’m a little disappointed you guys didn’t support this more. I’m glad to hear now that you’re coming with an expansion pack, but I hope it turns out to be a whole lot of new stuff, some that introduces new gameplay. Anyway, Eden is just an exquisite game with fantastic music and wonderful art direction. Please, reverse gravity, warp time toward multidirectional (rather than linear), do whatever you can to turn my head upside down in surprising ways! man…i know it might seem soon but my girlfriend and i are ready for PixelJunk Monsters 2. or at least another new island. PLEASE hear this request. the people want it. the first game is still one of the most played games on my PS3 (playing PJM with her makes her love the PS3 as much as i do so that when i’m playing Killzone 2, Madden or Fallout3 she understands lol). PIXEL JUNK MONSTERS 2! PLEASE! will the PSP version of PJM have the same islands and levels as the PS3 version or will it be new material? or a mix? thanks. I really liked PJ Eden till I got to the Gravity switching stage. Man did that one piss me off. As soon as I built up enough plants to get to the spectra, that a*hole thing would show up then bam gravity now goes to the right. Beauty! This is the news I’ve been waiting to hear! I cannot even tell you how much I love Eden, best psn game by far!!! Omg why am I using so many exclamation marks!!!! Looking forward now to news on the next game. Cant wait For PixelJunk #4!!!! Can we hear about it anytime soon? this month? next? Dylan! I’ve been wanting to hear some news for awhile, thanks for spilling the beans. What will the price be on Eden Encore? DYLAN!!! 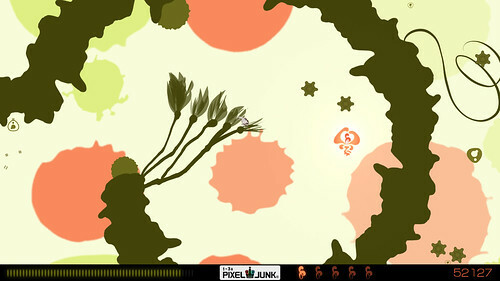 Please, can you guys make a vetically-scrolling shooter as one of the upcoming PixelJunk games? Your unique flair and cool soundtracks would be a great twist, and plus, there is no existing competition on the PSN in this genre, aside from 1942: Joint Strike.. We need a good VSS on the PSN. Wow that is going to be great. I’ve been wondering about PJ Eden Enore for a while now since someone mentioned it months ago. And yes PJ Monsters on PSP will be awesome. I have a PSP but my network connection seems to be a little too slow to handle the game. Is this going to be UMD or PSN? I’m assuming PSN download since that’s what you guys do best. Hmm may have to pick up another memory card. Just to put another bee in your bonnet. But yes before all that I’d like to see Pixeljunk 4. Q-Games and ThatGameCompany are the best developers on PSN. And that’s not flattery! It’s just true! Hope to hear from you soon. I only ask for one thing, for Eden and EdenEncore. If i may ask, should we be expecting PixelJunk #4 at GDC? Or will you be showing off Eden Encore? When’s the physical media version coming? lol @ not proof reading blog posts for EPIC spoilers. For those of you who didn’t catch it, they edited the post since it said there would be a PSP version of Monsters. All I have to say is…why not pool all current PJ games into one DL(or UMD if you MUST) and release that? So not one person yet has caught on to the Big Secret trademark hint? Haven’t they already announced a PSP version of Monsters? So not really “EPIC” of a spoiler. I wish we can edit our comments. Good luck at the GDC choice awards fellas! Man what an awesome summer I had with PJ Eden, by far the most fun game of the psn store at the time of release. I bought the Music from the game through the psn store and its amazing you sold that for 3 bucks. P.S. I still can’t believe I got all the Spectra (almost all seeds, but missing some since I got into the 7th garden). Thanks for making a challenging game, not ÜBER HARD, like Killzone 2 on Elite, I’m at the final confrontation scene, and can’t finish the game because of “Unfair Cirumnstances”. anyways…if it had already been announced why would they remove the line and simply leave us with a hint? It’s not very often these posts get edited unless its a bad hyperlink. Either way I don’t think anything official was mentioned regarding PJM PSP yet. One of the best IF NOT THE BEST psn game, wow imagine playing eden on PSP, that would be amazing. Im getting this for sure. i wonder what the surprise can be. cannot wait to find out… ill def buy anything you guys put out. Trade Mark after Big Secret? Is that a hint? :-) I’m anxiously waiting for more Eden! I downloaded the latest Eden patch but I got no trophy when I got all 5 spectra from garden 3. No, I didn’t use continues or anything. I had 3 spectra before the patch and got the two other after. I will purchase new Eden DLC. It is paid, right, not free? Free would be amazing, but I kind of doubt it. Yes, it isn\’t free.. but it is pretty cheap! It\’s worth it just for the new music alone. There are no trophies for getting all 5 spectra in ANY of the gardens. The first 10 trophies are for “opening all SEEDS” in a garden. For example, there are 29 seeds in the first garden. After you pollinate and sprout all of them, you get your trophy. I just checked and there are 31 seeds to open in garden 3. You only get a trophy for getting all 5 spectra in ALL of the levels (50, total). Why is there no physical media version yet? I’m a big fan of your Eden creation. Loved it since the Demo. It was a pleasure to finish it completely getting too the 100% of its trophies, and I’m quite happy with the idea of the Encore. I’ve the soundtrack, and after this game I started to look for the Baiyon works on his site. Glad to know the game was nominated at the GDC Choice Awars (I was one of those who voted for it at the Independent Game Festival). 1.- On the early days of the game, I saw a video in which Q-Games was showing a Beta state of PixelJunk Eden. That video shown a different physics of the game along with a different version of the Baiyon song featured for the main Eden garden (Become Part Of This). May be available for the fans in the near future that kind of Demo material?, it sounded nice ! Hey there, the physics in that old video were pretty much the same – but some sites had the video playing at x2 speed! This is why the physics look different. The music on the old prototype title screen was a tentative test track and might have used some copyrighted samples so we had to pull it unfortunately. 2.- On its Encore part, will it include a few more trophies?, that would be nice to add more length to the game experience. 3.- That new Baiyon music for the encore will be released in any media? 3 – we\’re not sure about a music release yet, if it is popular enough then we\’ll definitely consider it. Garden 8\’s paint drops were a really nice touch by Baiyon and he\’s put a lot of effort into the new backdrops in Encore too. IN-GAME XMB MUSIC OPTION PLEASE! Thanks Dylan, and yeah those were questions, no doubts. Excuse my english. By the way it would be nice that more developers put demos about their works, because thank of the Demo I bought Eden, but unfortunately there are no demos for the other two products you’ve so I’ve never knew what the others 2 titles may give to me. Videos or screens are not always enough and I’ve been always asking myself it Monsters may switch my style like Eden did. A demo would be nice. -> And to LN_MEXWARRIOR: there’s the option to custom soundtracks already on PixelJunk Eden, but it’s enabled at the very end of the game as a bonus when you finish something. Continue with the journey, you’ll see it !